The Horchow Collection is a mail-order retailing empire that specializes in home decoration items of different styles and brands. 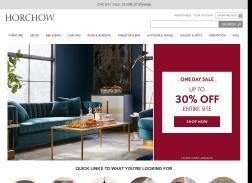 Shop the Decorating Sale and save 25% off decor, rugs, and window treatments at Horchow.com! Get 30% Off Select Towels with many colors and styles. Dress Up Your Table For Less! Shop select Dinnerware Under $200 Today! Offer Valid While Supplies Last. Get Outdoor Decor Under $500. For a limited time only. Save 25% on Everything for Trade Members. Limited Time Offer. Sign up for Horchow Email and Receive a 20% Off Promo Code! Valid for New subscribers. Limited time only. New Year Sale! Enjoy 25% off, plus Free Shipping on your $50+ purchase Use code for Free Shipping. Shop Select 5X8 Rugs Under $600. Valid for a limited time. Get up to 30% Off Select Cabinets and Bookcases. After Christmas Clearance! Get 50%-65% off selected epicure & holiday decor, including MacKenzie-Childs, Jay Strongwater & more. Get Free standard Shipping every day on select Towels. Tumi Sale! Get 20-40% Off Select Tumi products. Offer ends 02/01/2019 at 09:00 a.m. CT.